The Sharon High School Eagles were shutout against the Middleboro High School Sachems losing 19-0 and now have a 1-8 record. They will be on the road again to face the Bellingham High School Blackhawks at 7pm on Friday. Middleboro scored twice in the first quarter on a 6 yard pass and a 25 yard pass. The first extra point was converted but the second was blocked. In the third quarter, the Blackhawks scored again on a 3 yard run, but the two point conversion failed. “Our run game was very poor against Middleboro, we probably only rushed for 20 yards or something like that,” co captain running back Aaron Strong. “We were forced to pass a lot and because it was so obvious were going to pass, it was easier to defend the pass game. We did not put up any points so it was a pretty tough loss,” he added. The offensive standouts of the game included senior quarterback Jeremy Ruskin, throwing for 95 yards and rushing for 14 yards, and senior wide receiver Brandon Buckman, catching three passes for 42 yards. The defensive standouts of the game included junior linebacker Johnny Sabb, with 11 tackles and 3 assists, and senior co captain defensive lineman Coleman Loftus, with 4 tackles, 5 assists, and a tackle for loss. This is only the second time this season the Eagles have been shutout, the first against the Canton High School Bulldogs, losing 39-0 on the road. As of 2004, the Eagles have not faced Bellingham, but have many similarities this year. Just like Sharon, the Blackhawks, sporting a 2-8 record, are dead last in their division and have not won a league game yet. Sharon is last in the Davenport Division and 11th in the Hockomock League. “I think going into Bellingham we will have a lot better preparation,” Strong said. “Coach is emphasizing that we know our plays, watch a lot of film on their offense so on defense you know exactly where to be. Offensively, hopefully everyone will know their place and that will allow us to have an improved running game,” he added. Bellingham is 0-3 at home losing to Canton in Week 2, the Dedham High School Marauders in Week 3, and the Dover Sherborn High School Raiders in Week 6. 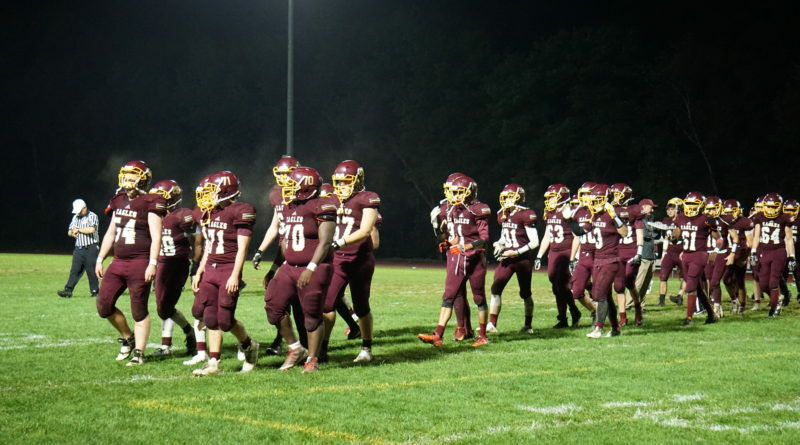 The Eagles are 1-4 on the road beating the Nauset Regional High School Warriors in Week 1 and losing to the Ashland High School Clockers in Week 2, the Milford High School Scarlet Hawks in Week 5, Canton in Week 6, and Middleboro last week.